The Co-development has always been a strong axis of Mouans-Sartoux's foreign policy. The city devotes 1% of the revenue of the water board to support projects led by local associations in countries that do not have the chance to access the same level of equipment as France. The place where students take organic and local meals. There is not food enough yet for everyone but soon it will be better. Each year, Antoine Dzamah, president of Sichem, a peasant organization located in the canton of Djagblé 25 km from the capital Lomé, is invited to Mouans-Sartoux in a partnership with the local association Méditerranée Afrique Solidarité. Creation of a well, a school, then a bookmobile ... A new project has sprung up in Togo, inspired by the experience of organic canteens and the agricultural management of Haute-Combe. Antoine Dzamah visited different places of food production and left with the idea of duplicating a suitable model for the benefit of schools in the canton, including a high school. 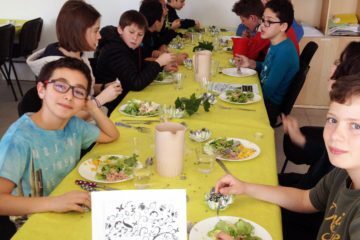 In a library created in 2015, a cafeteria has just been created, allowing a few dozen pupils to eat some organics meals with local products from Sichem farm. Food education is the main project. Malnutrition is still important in the country: one-third of the population is undernourished and 97% of Togolese children do not have a diet that meets the appropriate nutritional criteria. 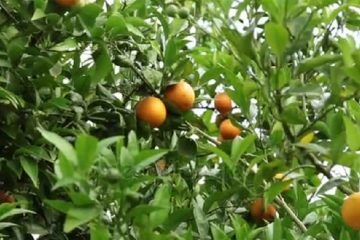 Acting on the levers of agricultural production and food is therefore a promising project, especially as local organic agriculture is mainly focused on exports. People consume many Chinese products, deemed cheaper but not guaranteed in quality ... 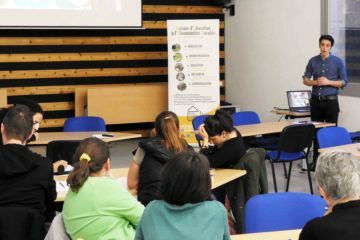 According to Antoine Dzamah, the objective of the Sichem project is threefold: "The aim is to develop an organic production on the farm that meets the food needs of the library's leisure space, to offer young people a healthy, balanced and appropriate diet, and finally to promote the local culinary arts. ". Togo thus appropriates the model of Mouans-Sartoux, by finding ways to adapt it to its own environment.